Tutorial Only – with this purchase you receive written step by step instructions on how to construct the project from start to finish. The instructions include photos demonstrating the step serving as a visual aid to help you along the construction process. This purchase does not include videos. Tutorial & Video Combo – with this purchase you receive written step by step instructions on how to construct the project from start to finish. The instructions include photos demonstrating the step serving as a visual aid to help you along the construction process. In addition to the step by step written instructions, you will receive step by step videos demonstrating each step in the construction process. I work along-side you each step of the way. This purchase is an instant download. Upon completion of your purchase you will receive two emails, (these emails will be sent to the email address associated with your purchase). Both emails will come from orders@paperphenomenon.com. You may want to add this email address to your contacts to avoid emails going directly into your spam folder. 2nd email is a Download Products Notice. This email is very important. This email provides you with a link to access your file from Box.com, but more importantly this email includes an Access ID. Why is your Access ID important? If you create an account in the Paper Phenomenon Shop – you will always have access to your instant downloadable files on demand. There will be no need to contact Paper Phenomenon Customer Service (PPCS) for help in retrieving your files. No need to provide PPCS with an invoice # as proof of purchase. No need to wait 24 hours for a response from PPCS. And you will avoid an admin fee for lost files. If you lose your files and require PPCS to send you files, you will be charged a $5 Admin fee. This fee only applies to customers with more than one request for lost files. Box, is a cloud content management (storage) and file sharing service. Box.com keeps all your files in one place which allows you access anywhere from any device. When your files are stored in Box you have a quick, easy and secure way to share/access files with other as well. On occasion Paper Phenomenon offers shipping promotions, at which time domestic customers receive free shipping if they spend over a certain amount. These promotions may change periodically. To keep updated with our latest shipping promotions sign up for our newsletter. Paper Phenomenon ships to most countries worldwide via USPS for all domestic and international packages. Depending on the size of your order, shipping charges will vary based upon shipping fees from USPS. For international shipping rates please visit the USPS website for rates. Upon shipping of your order, you will receive a tracking number via email. Very important, please be sure to double check that your email address is correct to ensure delivery of important order information. The processing time for orders is 24 hours. After that, delivery time within the United States is 2-6 days, and 10-15 business days internationally. Please keep in mind that during holidays this time may vary. Thank you for your patience. We are not responsible for any shipping deliveries that may be affected by customs, natural occurrences, transfers from USPS to the local carrier in your country or air and ground transportation strikes or delays, nor any extra fees, customs or back end charges once the package has exited our facility. Packages undeliverable by USPS and/or their international shipping partners will be cancelled and refunded once received and processed at our facility. You will receive a welcome email upon sign up which explains the shipping schedule for each kit club. This purchase is an instant download. Upon completion of your purchase, you will receive two emails, (these emails will be sent to the email address associated with your purchase). Both emails will come from orders@paperphenomenon.com. You may want to add this email address to your contacts to avoid emails going directly to your spam folder. 2nd email is a Download Products Notice. This email is very important. This email provides you with a link to access your file, but more importantly, this email includes an Access ID. Why is your Access ID important? 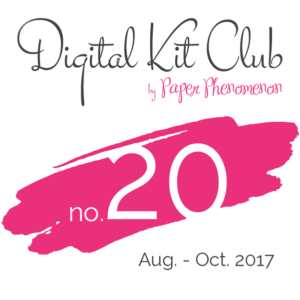 If you create an account in the Paper Phenomenon Shop – you will always have access to your instant downloadable files on demand. There will be no need to contact Paper Phenomenon Customer Service (PPCS) for help in retrieving your files. No need to provide PPCS with an invoice # as proof of purchase. No need to wait 24 hours for a response from PPCS. And you will avoid an admin fee for lost files. If you lose your files and require PPCS to send you files, you will be charged a $5 Admin fee. This fee only applies to customers with more than one request for lost files. Tutorial & Video Combo order will be filled within 24 hours of purchase. This purchase will be delivered to you via email. You will receive an email that will contain a link to a project folder located on Box.com. Upon completion of your purchase, you will receive two emails, (these emails will be sent to the email address associated with your purchase). We accept PayPal MasterCard, Visa and American Express. We do not accept returns, exchanges or refunds. All sales are final. Services, which shall be defined below. updated, revised or modified terms, you must stop using the provided Services forthwith. the laws and statutes of the United States or other applicable jurisdiction. Services, you are no longer anonymous to us. future use of Paper Phenomenon, Inc. Services, or any portion thereof. content provided are age-appropriate for his/her child. any failure to comply with this term and/or condition of the TOS. considered offensive to other visitors, users and/or members. whole or in part, is expressly prohibited. terminate at such time when you elect to discontinue your membership. and shall terminate at such time when you elect to discontinue your membership. to members only, would include our mail system and instant messaging. Terms of Service and/or your violation of any such rights of another person. for any commercial reason any part, use of, or access to Paper Phenomenon's sites. modify, alter and/or update these general practices and limits at our discretion. consent to allow Paper Phenomenon, Inc. to store any and all communications on its servers. any such dealings or as a result of the presence of such advertisers on our website. decisions based on any such information. that would have been delivered had you accessed our Services in an authorized manner. You herein acknowledge, understand and agree that all of the Paper Phenomenon, Inc.
content. For more information, please visit our website at https://paperphenomenon.com/. and conditions that may apply when you use or purchase certain other Paper Phenomenon, Inc.
Services, affiliate Services, third-party content or third-party software. and the other provisions of the TOS remain in full force and effect. 1 year(s) after said claim or cause of action arose or shall be forever barred. The Paper Phenomenon Web Site (the "Site") is provided by Paper Phenomenon, Inc, subject to your compliance with the terms and conditions set forth below. PLEASE READ THIS DOCUMENT CAREFULLY BEFORE ACCESSING OR USING THE SITE. BY ACCESSING OR USING THE SITE, YOU AGREE TO BE BOUND BY THE TERMS AND CONDITIONS SET FORTH BELOW. IF YOU DO NOT WISH TO BE BOUND BY THESE TERMS AND CONDITIONS, YOU MAY NOT ACCESS OR USE THE SITE. PAPER PHENOMENON, INC MAY MODIFY THIS AGREEMENT AT ANY TIME, AND SUCH MODIFICATIONS SHALL BE EFFECTIVE IMMEDIATELY UPON POSTING OF THE MODIFIED AGREEMENT ON THE SITE. YOU AGREE TO REVIEW THE AGREEMENT PERIODICALLY TO BE AWARE OF SUCH MODIFICATIONS AND YOUR CONTINUED ACCESS OR USE OF THE SITE SHALL BE DEEMED YOUR CONCLUSIVE ACCEPTANCE OF THE MODIFIED AGREEMENT. The entire contents of the Site are protected by international copyright and trademark laws. The owner of the copyrights and trademarks are Paper Phenomenon Inc, Paper Phenomenon.com, its affiliates or other third party licensors. YOU MAY NOT MODIFY, COPY, REPRODUCE, REPUBLISH, UPLOAD, POST, TRANSMIT, OR DISTRIBUTE, IN ANY MANNER, THE MATERIAL ON THE SITE, INCLUDING TEXT, GRAPHICS, CODE AND/OR SOFTWARE. You agree to grant to Paper Phenomenon, Inc a non-exclusive, royalty-free, worldwide, perpetual license, to reproduce, distribute, transmit, publicly display and publicly perform any materials and other information (including, without limitation, ideas contained therein for new or improved products and services) you submit to any public areas of the Site (such as social media sites, forums and newsgroups, youtube) or by e-mail to Paper Phenomenon.com by all means and in any media now known or hereafter developed. You also grant to Paper Phenomenon, Inc. the right to use your name in connection with the submitted materials and other information as well as in connection with all advertising, marketing and promotional material related thereto. You agree that you shall have no recourse against Paper Phenomenon, Inc. for any alleged or actual infringement or misappropriation of any proprietary right in your communications to Paper Phenomenon, Inc.
Publications, products, content or services referenced herein or on the Site are the exclusive trademarks or service marks of Paper Phenomenon, Inc. Other product and company names mentioned in the Site may be the trademarks of their respective owners. You understand that, except for information, products or services clearly identified as being supplied by Paper Phenomenon, Inc. does not operate, control or endorse any information, products or services on the Internet in any way. Except for Paper Phenomenon, Inc. - identified information, products or services, all information, products and services offered through the Site or on the Internet generally are offered by third parties, that are not affiliated with Paper Phenomenon, Inc. a. You also understand that Paper Phenomenon, Inc. cannot and does not guarantee or warrant that files available for downloading through the Site will be free of error, infection or viruses, worms, Trojan horses or other code that manifest contaminating or destructive properties. You are responsible for implementing sufficient procedures and checkpoints to satisfy your particular requirements for accuracy of data input and output, and for maintaining a means external to the Site for the reconstruction of any lost data. YOU ASSUME TOTAL RESPONSIBILITY AND RISK FOR YOUR USE OF THE SITE AND THE INTERNET. PAPER PHENOMENON, INC. PROVIDES THE SITE AND RELATED INFORMATION "AS IS" AND DOES NOT MAKE ANY EXPRESS OR IMPLIED WARRANTIES, REPRESENTATIONS OR ENDORSEMENTS WHATSOEVER (INCLUDING WITHOUT LIMITATION WARRANTIES OF TITLE OR NONINFRINGEMENT, OR THE IMPLIED WARRANTIES OF MERCHANTABILITY OR FITNESS FOR A PARTICULAR PURPOSE) WITH REGARD TO THE SERVICE, ANY MERCHANDISE INFORMATION OR SERVICE PROVIDED THROUGH THE SERVICE OR ON THE INTERNET GENERALLY, AND PAPER PHENOMENON, INC. SHALL NOT BE LIABLE FOR ANY COST OR DAMAGE ARISING EITHER DIRECTLY OR INDIRECTLY FROM ANY SUCH TRANSACTION. IT IS SOLELY YOUR RESPONSIBILITY TO EVALUATE THE ACCURACY, COMPLETENESS AND USEFULNESS OF ALL OPINIONS, ADVICE, SERVICES, MERCHANDISE AND OTHER INFORMATION PROVIDED THROUGH THE SERVICE OR ON THE INTERNET GENERALLY. PAPER PHENOMENON, INC. DOES NOT WARRANT THAT THE SERVICE WILL BE UNINTERRUPTED OR ERROR-FREE OR THAT DEFECTS IN THE SERVICE WILL BE CORRECTED. YOU UNDERSTAND FURTHER THAT THE PURE NATURE OF THE INTERNET CONTAINS UNEDITED MATERIALS SOME OF WHICH ARE SEXUALLY EXPLICIT OR MAY BE OFFENSIVE TO YOU. YOUR ACCESS TO SUCH MATERIALS IS AT YOUR RISK. PAPER PHENOMENON, INC. HAS NO CONTROL OVER AND ACCEPTS NO RESPONSIBILITY WHATSOEVER FOR SUCH MATERIALS. IN NO EVENT WILL Paper Phenomenon, Inc. BE LIABLE FOR (I) ANY INCIDENTAL, CONSEQUENTIAL, OR INDIRECT DAMAGES (INCLUDING, BUT NOT LIMITED TO, DAMAGES FOR LOSS OF PROFITS, BUSINESS INTERRUPTION, LOSS OF PROGRAMS OR INFORMATION, AND THE LIKE) ARISING OUT OF THE USE OF OR INABILITY TO USE THE SERVICE, OR ANY INFORMATION, OR TRANSACTIONS PROVIDED ON THE SERVICE, OR DOWNLOADED FROM THE SERVICE, OR ANY DELAY OF SUCH INFORMATION OR SERVICE. EVEN IF Paper Phenomenon, Inc. OR ITS AUTHORIZED REPRESENTATIVES HAVE BEEN ADVISED OF THE POSSIBILITY OF SUCH DAMAGES, OR (II) ANY CLAIM ATTRIBUTABLE TO ERRORS, OMISSIONS, OR OTHER INACCURACIES IN THE SERVICE AND/OR MATERIALS OR INFORMATION DOWNLOADED THROUGH THE SERVICE. BECAUSE SOME STATES DO NOT ALLOW THE EXCLUSION OR LIMITATION OF LIABILITY FOR CONSEQUENTIAL OR INCIDENTAL DAMAGES, THE ABOVE LIMITATION MAY NOT APPLY TO YOU. IN SUCH STATES, Paper Phenomenon, Inc. LIABILITY IS LIMITED TO THE GREATEST EXTENT PERMITTED BY LAW. Paper Phenomenon, Inc. makes no representations whatsoever about any other web site which you may access through this one or which may link to this Site. When you access a non- Paper Phenomenon, Inc. web site, please understand that it is independent from Paper Phenomenon, Inc., and that Paper Phenomenon, Inc. has no control over the content on that web site. In addition, a link to a Paper Phenomenon, Inc. web site does not mean that Paper Phenomenon, Inc. endorses or accepts any responsibility for the content, or the use, of such web site. By using our Social Media Sites, you agree to upload and post only Content (text, images, graphics, photos) that you have created yourself using Paper Phenomenon Tutorials. You agree not to use these Community Services to upload, post, or otherwise transmit or communicate any material that is obscene, offensive, pornographic, threatening, menacing, abusive, harmful, an invasion of privacy or publicity rights, defamatory, libelous, vulgar, illegal or otherwise objectionable. You further agree upon the use of this Service not to upload, post, or otherwise transmit or communicate any material which infringes any copyright, trademark, patent or other intellectual property right or any moral right of any party including, but not limited to Paper Phenomenon, Inc. Furthermore, you agree not to upload and post to our Community User Content for any commercial purpose. Other crafter’s business name, for example, may not be mentioned in the Title or description. Be sure not to mention were items were purchased if sold on the Paper Phenomenon website. Paper Phenomenon, Inc. is not responsible for the accuracy or intellectual property rights of user uploaded Content (text, images, graphics, photos). You agree to conform to our polices and guidelines concerning user uploaded Content. Submitting User Content that violates these rules or any applicable local, national or international laws may subject you to termination of your user rights. We reserve the right to edit or delete any User Content that we consider unacceptable or inappropriate, or for any other reasons at our convenience and discretion. Additionally, we reserve the right to deactivate any user at any time with or without prior notice. You agree not use our Community for direct advertising or selling of your product or service. You may mention other craft related stores or websites as long as they are not in direct competition with this website. By submitting User Content to Social Media Sites for a Contest, Challenge, or Sweepstakes, you agree to all Terms and Conditions of stated Contest, Challenge, Sweepstakes. While we do our best to maintain the privacy of messages you post in private sections of our Community (Private Messages on social media), it is NEVER safe to post your phone number, address, location or any personally identifiable information in any message on the Paper Phenomenon Social Media sites. We recommend that you avoid posting personally identifiable information to any forum because it is impossible to entirely verify the identity of the person you are talking to over the Internet. This includes sending personal information through private messages and private forums. While we do work very hard to maintain the privacy of your private messages, we cannot offer a guarantee concerning the reliability or safety of this free service. If you do post such personal information please be aware that you do so at your own risk. By using our Community Services, you agree not to transmit any unsolicited or unauthorized advertising, promotional materials, junk mail, spam, chain letters, pyramid schemes, or any other form of solicitation; to impersonate any person or entity, or otherwise to misrepresent your affiliation with a person or entity; or to collect, intercept or harvest screen names, to collect, intercept or store personal data about other users of the Service or to solicit or attempt to discover a user's password, screen name or other registration information without the user's express knowledge and consent. You further agree that not to interfere with or disrupt (or attempt to interfere with or disrupt) this Service or servers or networks connected to this Service, or to disobey any requirements, procedures, policies or regulations of networks connected to this Service; provide any information to Paper Phenomenon, Inc. that is false or misleading, that attempts to hide your identity or that you do not have the right to disclose. By submitting Content to the Site, Social Media Sites, you hereby grant Paper Phenomenon, Inc. the right to use, copy, adapt, modify, publicly display User Content for the purpose of education, promotion, and advertising. Paper Phenomenon, Inc. does not claim any ownership rights of any such User Content. As a user of our Social Media Community, Fan Page, etc, you agree to remain solely responsible for the content of your User Content and agree to indemnify and hold Paper Phenomenon, Inc. and its subsidiaries, officers, agents, affiliates, and employees, harmless from any claim or demand based upon transmission of your message. The prices of the items on this website are listed by each item's description. Despite our best efforts, prices may be listed incorrectly due to human or computer error. In the event of a pricing error, we will NOT honor the incorrect "error" price. This policy applies to pricing on our website and our Newsletters. Known pricing errors will be published in the product description tab. If you have completed a purchase with an incorrect price, and that price is lower than the actual item cost, we will at our discretion contact you for instructions before the shipment of that item, or cancel your order for that item and notify you of such cancellation. If you have completed a purchase with an incorrect price, and that price is higher than the actual item cost, we will refund you the difference. This does not apply to regular price changes for our weekly sales. We cannot adjust the prices of items due to listing errors or guarantee the availability of any item prior to sale. Product availability is listed by each item's description. We monitor and check product counts frequently; our software reduces available quantities when a product is sold. Though we strive for perfection, sometimes our product counts are incorrect. We do not back-order out of stock items. If an item is not available when we process your order, we will refund you the amount of the out of stock item. When you place an order at Paper Phenomenon, Inc. we will send you an e-mail confirming receipt of your order along with the product details of your order. Your order represents an offer to us to purchase a product which is accepted by us when we send e-mail confirmation to you that we have shipped that product to you (“shipping confirmation e-mail”). That acceptance will be complete at the time we send the order confirmation e-mail to you. Any products on the same order which we have not been confirmed in a shipping confirmation e-mail do not form part of that contract. Paper Phenomenon, Inc. is not liable for incorrect or invalid email addresses submitted. Completing an order from Paper Phenomenon, Inc. in any form constitutes acceptance of these terms and conditions. We reserve the right to refuse any customer we suspect of unauthorized resale of any Paper Phenomenon, Inc. products. Unauthorized reselling of these products is strictly forbidden, and will be considered a violation of these terms of agreement. Paper Phenomenon, Inc. also reserves the right to refuse sale to any customer we consider to be in violation of our terms of agreement. Discount codes apply to the regular, non-discounted price of each item. Free-shipping codes only apply to orders shipped within the continental United States. Some items are not subject to discounts. We reserve the right to deny any discounts or special offers that have been applied incorrectly, or that have expired. Discount codes may be used only once per customer unless otherwise noted, and expire 30 days after issuance unless otherwise noted. Discount codes and special offers may not be combined, unless otherwise noted. Acceptance of any discount code by our website does not automatically mean we are obliged to honor that discount. We have a no returns policy. All sales are final. If you pre-order items with other items that are not on pre-order, we will hold your order until all products have been received at our facility before shipping your order. Estimated shipping dates may vary according to manufacturer fulfillment; unexpected delays sometimes occur. We are unable to provide specific ETA dates. Current promotional codes for in-stock items will usually also apply to pre-order items as well, though there may be some exceptions. If, for any reason, we are unable to fulfill any pre-ordered item orders, you will receive a full refund of the purchase price. You agree to indemnify, defend and hold harmless Paper Phenomenon, Inc., its officers, directors, employees, agents, licensors, suppliers and any third party information providers to the Service from and against all losses, expenses, damages and costs, including reasonable attorneys' fees, resulting from any violation of this Agreement (including negligent or wrongful conduct) by you or any other person accessing the Service. The provisions of paragraphs 2 (Use of the Service), and 3 (Indemnification) are for the benefit of Paper Phenomenon, Inc. and its officers, directors, employees, agents, licensors, suppliers, and any third party information providers to the Service. Each of these individuals or entities shall have the right to assert and enforce those provisions directly against you on its own behalf. This Agreement shall all be governed and construed in accordance with the laws of The United States of America applicable to agreements made and to be performed in The United States of America. You agree that any legal action or proceeding between Paper Phenomenon, Inc. and you for any purpose concerning this Agreement or the parties' obligations hereunder shall be brought exclusively in a federal or state court of competent jurisdiction sitting in The United States of America. Any cause of action or claim you may have with respect to the Service must be commenced within one (1) year after the claim or cause of action arises or such claim or cause of action is barred. Paper Phenomenon, Inc. failure to insist upon or enforce strict performance of any provision of this Agreement shall not be construed as a waiver of any provision or right. Neither the course of conduct between the parties nor trade practice shall act to modify any provision of this Agreement. Paper Phenomenon, Inc. may assign its rights and duties under this Agreement to any party at any time without notice to you. not only to meet but to exceed most existing privacy standards. parent or guardian permission to use this website. and solely to the information collected by our website. the user's personal information under our control. use of their information in this separate manner.